“A passionate hobby” is how Dan Graham explained his career at the Walker Art Center’s, Beyond lecture. A humble but accurate description of his work, you can see he doesn’t just make art – lives a designed life. Graham’s ability to live design gives him a unique capability to be all encompassing: film, performance, photography, architecture, installation, print, and even writing. The exhibition and lecture energized me! Graham’s ability to focus on the relationship between art, the viewer, the environment, and even an unknowing passer bye – was exhilarating. I like to believe it’s important as a viewer to understand your own element in observing or taking in art. He makes the viewer think about the ways in which each space, motion, concept, perspective, and sound affects behavior. The Walker also took Graham’s motifs and concerns in mind while organizing this lecture. Graham not only shared the stage with curators and critiques but musicians. Japanther, a punk rock band from New York, introduced Dan Graham and also shared the spot light. Not only did the viewer of this lecture get to experience Graham’s humor, vast archive of artist knowledge, and work but his belief of the strong bond between art and under ground music. This was a well-rounded exhibition. 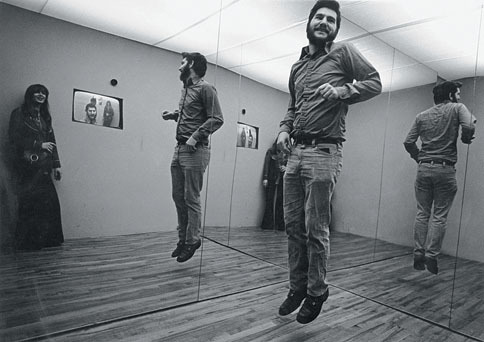 I urge people to look at Dan Graham’s work.